I was honored to have been asked to share yesterday morning at a Perinatal Bereavement Class for medical professionals at Rex Hospital in Raleigh, NC, where Lily was born. 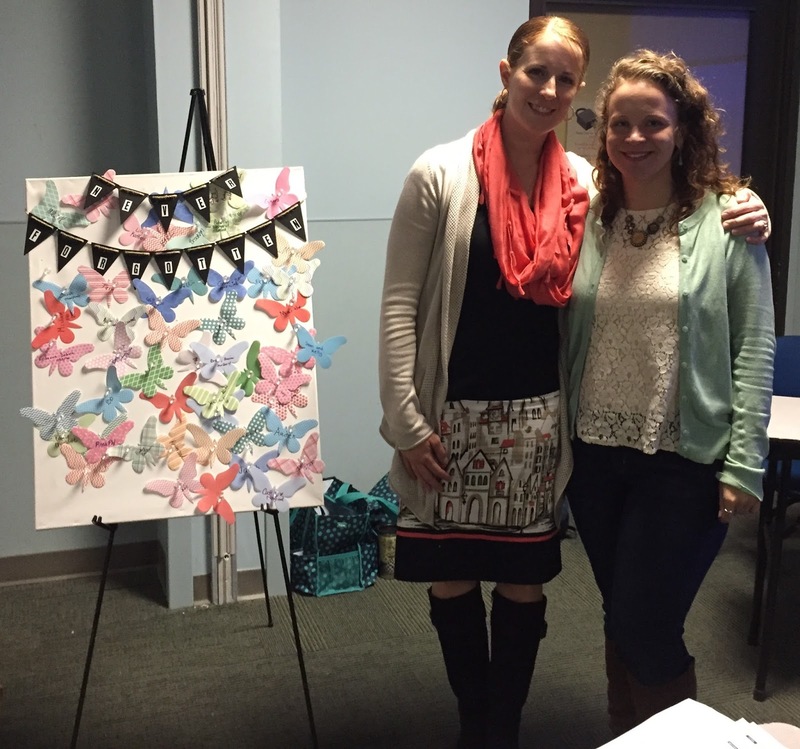 October is Pregnancy and Infant Loss Awareness Month, so this special class lined up well with that. My friend Heather, who also delivered her daughter who was stillborn at the same hospital just a few months before Lily, shared as well. It was neat to see how even though we have different stories and experiences, there were a lot of similarities there too... in what we appreciated from the care we received and the things we agree could be improved. There was a table where I set up some of my most precious keepsakes, the tangible things I took home from the hospital that prove Lily was real. 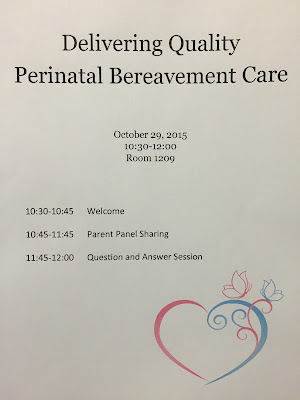 There were a couple tables with all the supplies the Perinatal Bereavement Committee has, things to be given to parents walking through the loss of a precious baby. There were also a couple snack tables. This is the room where it was held. I wasn't sure how I was going to share. I thought of just speaking on the spot from my heart, but then was reading over my birth story that I wrote out shortly after Lily was born. It has many vivid details that I wouldn't fully be able to articulate just speaking, so I decided to tweak it a bit and read that. I cried a few times while I read it because it took me right back. 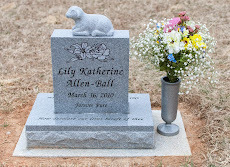 After I finished, I shared a few photos from my pregnancy, of Lily and I at the hospital, some memorial photos, and photos of her headstone. I was thankful for the positive feedback both Heather and I received. Before we even left the hospital, we ran into some of the ladies who work in the lactation "department" for lack of a better word (one of the ladies had been in the class) and we learned that they are already working to implement something new because of what Heather and I shared. One of the most painful things after losing a baby in the immediate days following is when your milk comes in and you have no baby to nurse. You cannot tell your body you don't have your baby anymore. We suggested that perhaps they directly talk with the mothers about their options and how they can get their milk to dry up quickly. Not only that, but they are going to be providing supplies to help with that process. That might seem like a small thing, something that wouldn't even cross most people's minds, but to a loss mom, it is huge. It was so special to hear about more change taking place already! It’s an honor to be here with you. Thank you to Sandra for asking me to share my story… not only my story, but my daughter’s story. My daughter Lily Katherine who would be 5 1/2 years old today, in Kindergarten, but she cannot speak for herself because she is not here. I don’t get to call her by name, so when I get to speak her name, when people want to hear her name, it means the world to me. It makes me feel like the mother I am. So often, as a mother with only a child I hold in my heart and none that I hold in my arms, I feel “left out” of the mommy club. But in moments like this when I can share about the very real pregnancy, labor, and birth of a very real little girl, it makes my heart bubble up with the pride of a mother for her child. Because I see how my little girl is impacting this world, in big and small ways. 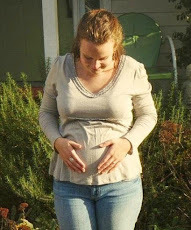 On Tuesday morning, March 16, 2010, I woke up at 2 a.m. with contractions. Could the time finally have come that I would go to the hospital and meet my daughter? My body had gone into labor and it was time. A couple of hours after I had gone to bed, I awoke to cramps coursing through my abdomen and as hard as I tried to go back to sleep, I met with no success. I wondered if these contractions could be real, because as a first-time mom, I was beginning to question if I would even recognize true contractions when they came. I had been having a lot of different pains and cramps in the previous days, weeks, and months. But, these were it. Soon, I got up and went to wake my mom. When I explained how I was feeling, she assured me that the time was here and suddenly the excitement and the reality of what was to come in the next few hours settled into our hearts. She began keeping track of all my contractions in her journal, when they started and how long they lasted. I'm not sure why, but I was expecting the pain to stop, like it couldn't possibly be real or something. I thought the pain would subside and I would soon be able to go back to bed. During my entire pregnancy, I kept saying that I didn't want to go into labor in the middle of the night. I was going to try to wait it out as long as I could. After reading up on pregnancy and childbirth, I was under the impression that labor would last hours before I actually needed to call my Dr. And I didn't want to be "that person" that calls the doctor in the middle of the night. The hours passed and contractions were hurting more and I realized that I really did need to call my doctor. I decided to wait until 5 a.m. Mom told me that all these pains were worth it, because I had my little girl to look forward to at the end of it all. She prayed that I would picture Lily's face in the midst of contractions and it seemed to ease the pain some. At 5 a.m., we called Dr. M, awakening him from his sleep. He said he would head over to the hospital. We started getting ready too. I put on the bright pink shirt that I had gotten that said "Coming this Winter." I was so excited my winter baby was finally almost here! My mom, sister, Emma, and I finally headed off to the hospital a little past 5:30 a.m. I remember looking over at my mom and noticing how tense she looked driving. I'm sure my moaning and groaning from contractions didn't help anything. She was driving as fast as she could, without breaking the speed limit. I thought to myself, maybe we should take a picture or video of us on our way to the hospital. But, it was still dark out and I didn't want to fuss with it. At 6 a.m., we arrived at the hospital, with no idea how drastically things would change within only a matter of minutes. We pulled up to the Rex Birthing Center, where I had seen so many women being pushed out in a wheelchair, with their precious new baby in their arms. Finally I was going to be the one with my babe in my arms, proudly showing her off for everyone to see. 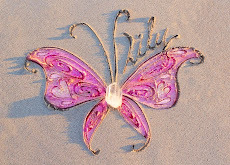 We would get to put Lily in her pink car seat with butterflies and take her home. Mom went to get the wheelchair to take me in because I was in too much pain to walk. My sister carried my stuff in for me. We told the security guard at the front desk that we had already let Dr. M know we were coming and he checked with the people upstairs. They were all ready for me. The elevator took us up to the second floor and we were instructed to wait in the waiting room up there. As soon as we got in there, the nurse came to take us to our room. She wheeled me down the hall. I was nervous, excited, and more awake than anyone should be at that hour of the day. My room was really nice and cozy. I dimmed the lights just right because it was still dark out. I had to change into my hospital gown right away. I remember looking down at my pink socks and pacing back and forth, back and forth. Mom noticed the birthing ball in the shower and was going to bring it out. We three were just thrilled. I was ready to get an epidural! First, my nurse, Shannon, had to make sure I was eligible to get one. She checked my heart rate and blood pressure, and then, just as they had done so many times before…that little monitor was put up to my swollen belly to check Lily's heart rate. Why wasn't I hearing it right away? The monitor was moved all over my stomach...high, low, left, right...still nothing. I looked at my mom, searching her eyes for comfort. I wanted her eyes to tell me everything was alright. Perhaps the equipment is faulty, or perhaps Lily is in a weird position, we both thought to ourselves. At the same time, a thousand thoughts of “what ifs” were racing through our minds. I was fullterm and babies don't die at fullterm, right? So, I honestly wasn't too concerned. We just needed my Dr. in there to make everything better. I had been to his office so many times before and we had always heard Lily's heart beating so sure, so strong. Everything is somewhat blurred together in my memory until Dr. M came in to do an ultrasound. When he came in, right away I could tell he looked concerned. Why is he looking that way? Within seconds, there was Lily on the screen. I couldn't tell what was going on. Several moments passed. What's going on? Why isn't he saying anything? I looked up at Shannon and saw tears welling up in her eyes, threatening to spill over at any time. "Hannah, this is where her heart is. And it's not beating anymore...I'm so sorry." What?! How could that be?! Is this just a nightmare?! When will I wake up?! I just want to wake up!! God can I please have her back?! But, there was nothing my doctor could do and there was nothing we could do...but cry. It all felt like a dream. A horrible, horrible nightmare. I glanced over at my little sister, just shy of sixteen at the time, having to carry this heavy burden of knowing her first niece had slipped away before she ever got to say hello. Seeing the quiet tears streaming down her face jolted me into this truth I had to face. Deep belly sobs rattled me to the core and I felt that ache in my heart that only comes from knowing your child is in the arms of the Lord, rather than here. Strong contractions coursing through my body were like salt on a wound, a bitter reminder that I had to deliver the body of my child who was already waiting for me in Heaven. Thankfully, I soon had an epidural. I would have been nervous, but because of this news, I didn't care. I just wanted the pain to stop...the physical pain, emotional pain...the physical pain didn't seem to matter much anymore. It seemed so stupid now that I had been stressing about it. The emotional pain, though, was excruciating. My whole life I had feared giving birth to a child. And now, here I was, having to give birth to my daughter of Heaven. At only 20-years of age. I asked Dr. M if I could have a c-section and he said for my health and for the health of future pregnancies, he wanted us to continue with a delivery, as long as I kept dilating and labor continued to progress. I didn’t put up a fight… which I’m so thankful for now. I had no idea how beautiful her birth would be. My mom called my dad and told him what happened. He and my brothers had planned on coming a few hours later. They couldn't believe it. Nobody could believe it. I mean, I was two days past my due date, I had a healthy and normal pregnancy, Lily was healthy, had a strong heart...everything was good. We had just had an ultrasound less than five days earlier and everything was set for delivery. Little did I know that was the last time I'd see her alive or hear her precious heart beating. So what happened? These thoughts and questions kept playing and replaying over and over again in my mind. My mom, sister, and I noticed how cloudy and gloomy the day was and how the weather outside was a reflection of how we felt. We talked about how God had prepared us for this without us even realizing it and how we knew He would be faithful to carry us through. 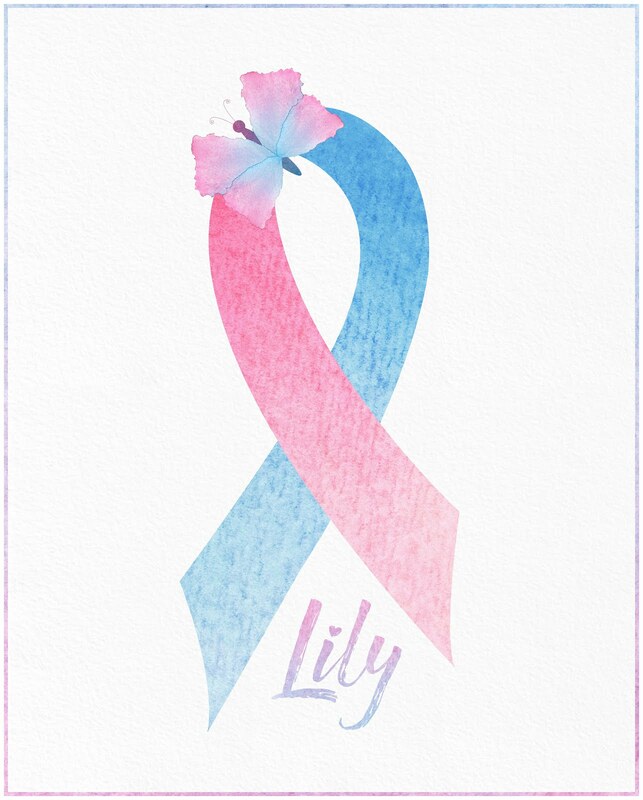 How blessed we are to have known Lily and all the wonderful times we had with her...how she's changed us and how we're better people from being a part of her life. How we could see God working through her life now, and how He already had, and how we know He will continue to. Laying in my hospital bed on March 16, I was suddenly overwhelmed with the depth of the meaning of her name. Both her first and middle names, Lily Katherine, mean purity and innocence and I realized that she will forever be pure and innocent. My mom called a couple people close to us to let them know what was going on. It was hard to see my loved-ones eyes full of tears. I didn't want others to have to go through this pain of losing a niece, granddaughter, friend, cousin. The loss of a baby impacts SO.MANY.PEOPLE. And it is lifelong. It is never something you “get over.” We will always wonder who Lily would be today and all that her full life would have held. We will always miss and love her beyond measure. She is irreplaceable. Instead, we had a leaf with a teardrop hanging on our door, to inform nurses and doctors that whoever was inside that room has a baby that didn't survive. My mom was the first to notice it. It really broke her heart to see it. Another thing that broke her heart was hearing in the room next door, a baby's heartbeat...what I should have heard that morning. We were all in that room together, sitting there. Still. Quiet. What was there to say? There were a lot of tears. A lot of pain. I was so tired, but couldn't sleep. I rested my eyes for a while. My nurse, Lanie, was absolutely wonderful. She took such good care of me. Taking care of my every need, she went above and beyond her job duties. She made me as comfortable as I could be under the circumstances. I am so thankful for her compassion. Before going to the hospital, I was concerned I wouldn't “click” with my nurses and I would feel uncomfortable with them. But, the opposite is true. I actually consider Lanie and Shannon my friends now. I could never thank them enough. I don’t know if nurses and doctors realize that we, their patients, remember them and their care forever, whether good or bad. And even the seemingly small things are big to us and can greatly shape our experience. Time kept passing. The hours kept passing. Soon, it was afternoon. I knew the time was coming that I would have to deliver my baby's body. Her body was still in my body, but her soul was with Jesus. How strange it was to think that. I kept dilating and labor kept progressing at a good rate. At around 3 p.m., I was dilated all the way and my body felt ready to push. I put it off for a while because I didn't want to do it. I didn't want to have to hold her like that. I didn't know what to expect with the delivery. I didn't know how she would look, having already passed. Quite frankly, I was frightened. By 4 p.m., it was time. Every one left the room except for my mom and sister. Lanie and Dr. M were both in the room. Within fifteen to twenty minutes of pushing, she was in my arms. I remember the first time my eyes beheld her little body. It is an image that will forever be engraved into my mind. Lifeless. Quiet. Still. The silence was deafening. No screaming and crying, or squirming around. I just wanted to hear her little cry...I never got to hear her cry. My heart was breaking. The tears were streaming down my face. I had pictured this moment my entire life, always longing with everything in me to be a mother. But, I never pictured it like this. Her body felt warm, like she was alive, only sleeping. She was beautiful. Perfect. Every detail of her just right. She was the most beautiful baby I have ever seen. Why had I been afraid? Her little nose was the first thing I noticed about her, so tiny and adorable. It looked like a miniature version of mine. I memorized every part of her. Every part of her, forever engraved in my mind. Wow, God made this perfect little person in only nine months. He chose me to carry her.... She had short little eyelashes like mine, almost nonexistent eyebrows, chubby cheeks and the same chin as mine, and the cutest heart-shaped lips. Mom said her lips were even like mine. Everyone said she looked like me. To this, I jokingly said, "poor thing." It was true though. Looking back at pictures of me as a newborn, I looked just like her. Her legs were even the same shape as mine. She had the same thumbs as me too. Her tiny fingers and toes were so cute. I couldn't stop staring at her. I had always imagined her bald like I was as a baby, but she had beautiful hair (the exact same shade as mine! ), though not very much of it. 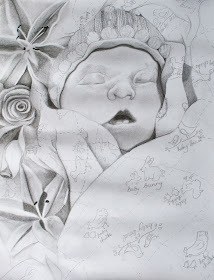 Birthing my little girl was a beautiful experience. I wouldn't change it. It made me feel more like her mother. I would have done things for her all her life, had she lived. But, she didn't, so this felt like one of the only and final things I could do for her. I just wish I could have heard her cry, seen her eyes, felt her breathe, smelt her sweet baby smell. We took lots of pictures with Lily. By this time, Shannon had come back for her next hospital shift and she requested to have me as her patient again, at least until I had to be moved to my postpartum room. I would think that a lot of nurses would have avoided a situation like this, but mine had compassion on me and actually cared. Another nurse, I can't remember her name now, had come in and told me she had a stillborn baby 12 years before. She really understood my pain. It was good to know I wasn't alone and that other people made it through such a loss before me. Lanie stayed late and helped Shannon take a mold of Lily's right foot. We could only do one of her feet because her feet and hands were so big! It took a few attempts because her little foot was so flat. 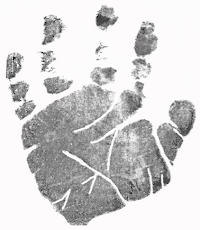 They also helped with getting her footprints and handprints… I am so thankful I thought to ask for her handprints too or else I wouldn’t have them… I wish I had gotten more than one set for my parents and others to have as well. I also got a little snippet of her hair. They dressed her in her little pink outfit that we had brought along for her to wear while meeting all her visitors for the first time. I still wanted her to look her best and oh, she did. The pink outfit had baby birds, baby chicks, and baby bunnies on it. She was swaddled in the matching pink blanket and had a cute pink hat on. It was one of my favorite outfits for her and pink is definitely her color. :) At times now, I wish I had dressed her myself...but she was so delicate and I didn't want to hurt her. The nurses were so gentle with her. They also took some pictures for me. I am so thankful that God was gracious enough to give me two wonderful, compassionate, sweet nurses. When Lanie left, she gave me an adorable little panda bear. I'll keep it forever with all of the other keepsakes that remind me of Lily. When everyone came in to see Lily and me, I felt so proud of her. I felt so proud that she was my baby. 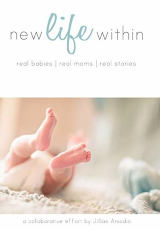 Around 9 p.m., I was taken to my postpartum room. I didn't want to leave Shannon. I didn't think I could possibly have nurses as dear as she and Lanie had been to me. Shannon placed Lily in my arms and I held her as I was pushed in the wheelchair to my recovery room. There was a blanket over her so nobody would see. She was so beautiful. I should be showing her off right now, I thought. Not hiding her. My eyes were already so puffy and I'm sure I looked horrible. I couldn't keep from crying. I saw people looking at me, wondering I'm sure what my story was. The two nurses I ended up having in my postpartum room, Kitty and Catie, turned out to be very caring and sweet as well. I could tell they really cared about me and my Lily. They took excellent care of me, were very sensitive to my needs, and made me feel completely comfortable. I could tell they both were trying to keep from crying. They didn't want me to see them with tears in their eyes. I'm sure they thought it would only make me feel worse. But I needed to see and know that they cared, that they are human. Everyone held Lily some more, we took more pictures, and I rocked her. It was painful to get up, but I had to rock my baby girl. Just once. I needed to. It felt so natural, holding her, rocking her...like I was comforting her, when really I was comforting myself. I didn't want all my visitors to leave that night. I didn't want to feel lonelier than I already felt. By midnight though, everyone was gone, but my mom. I was exhausted. I had been up for so many hours and was physically and emotionally drained. I was afraid to sleep, afraid of the stillness, the darkness of the night. Lily stayed in my bed that night with me. I'm so thankful to the hospital for letting me have her for that long. I held her all night. It was really difficult to sleep, especially with nurses periodically coming in to check on me. At one point in the night, I started crying, from the very depths of my soul. I woke my mom up and she cried with me. All she could say when I cried like that during those first few days was, "I know...I know." She said it softly, sweetly. Like it was the only thing to say. And I knew what she meant. I knew she understood. I knew her heart was breaking for her flower, because I had lost my flower. Only a mother's love...her heart was breaking as well because she had lost her precious first granddarling, long hoped for, long adored. The hospital chaplain, Carla, came in to talk with us that next morning, March 17th. It was St. Patrick's Day and I remember seeing people with green hats and shirts. Whenever someone new came in the room and I saw the way they looked at me, I couldn't keep from crying. Carla told us she too had lost a baby herself. I could tell we had a little special place in her heart. She knew just what I was going through. She talked with us and prayed with us. Twice in the hospital, I was told by staff that they had lost a baby. I began to realize just how many people live with such a difficult loss. Why had I never heard about it before then if so many people have experienced it? It is a life-altering and crushing loss, but so often seems to be swept under the rug. That is partly why I speak out… for the mothers from decades past who never felt like they could. Catie kept coming in to tell me I could leave whenever I felt up to it, but I didn't want to leave. Leaving meant leaving the hospital...without Lily. Leaving meant going home with empty arms. I was alone with Lily for only a short amount of time during the stay at the hospital. But, in that time, I spoke with her, hugged her, kissed her, knowing these would be the only moments I would ever have alone with my little girl, my first-born baby. From the time we found out Lily's heart was no longer beating to the following afternoon, I couldn't decide if I wanted to have an autopsy done or not. I asked several people their opinion on what I should do. I wanted to make sure I could see her again in her burial outfit. It was supposed to be her going home from the hospital outfit, but instead it was her going home to Jesus outfit. I remember feeling like it didn't matter what the results of an autopsy would show because it wouldn't bring her back. I prayed that if the Lord wanted me to have one done that it would work out because I had no idea what to do. At first I said no, but the staff later said the hospital was offering to do it for me free of charge, so I accepted. I had no idea that I would eventually be extremely thankful for this decision so I could have some answers. I am thankful they gently brought it up more than once to give me time to think and make a decision I was not prepared to have to make. You never think that the words “baby” and “autopsy” belong in the same sentence. Early afternoon, Catie came in and told me they had to take Lily away. I could tell it broke her heart to tell me this. I burst into tears, asking if that meant I wouldn't get to see her again at the hospital. No. No. No. I can't let her go. She's mine! Just go away. Less than 24 hours with her...that's all I had. I had to fit an entire lifetime's worth of memories into less than a day. After a few moments alone with my precious princess, I collected myself and placed Lily in the little baby cart that I had seen newborns taken to the nursery in. But, she wasn't going to the nursery. A blanket was placed over her. It was the hardest thing I ever had to do, to let go of her. In tears, I watched as they took her away from me, down the hallway and around the corner, out of site. I asked to have the blanket and outfit she was in and I'm so glad they were able to get them back to me. I'll keep them forever with Lily's things. After Lily left, I walked slowly down the hallway. Crying. I didn't know what to do without her there. My mind knew she was gone, but my body, my heart was longing for her. I couldn't explain to my body that there wasn't a baby to nurse, there wasn't a baby to hold. My arms were lost without her. I noticed on one of the doors a big pink ribbon. I figured a family was in there, happy. A new baby girl in their arms. It didn't seem fair. On my door, there was that dreadful leaf with a teardrop on it. How could this be me? The nurses gave me everything I would need to physically heal in the coming weeks. And we packed up and left...with empty, aching arms and broken dreams and hearts. All I had was a small white pouch, with memories of my little girl. Proof that she was real. I asked to be taken out the main entrance. I didn't want to have to see all the happy new mothers with their babies in the birthing center. I wondered what I was supposed to do? Where I was supposed to go from there? How strange it was to get in the car and leave with less than what I had come with. I remember thinking I should be sitting in the back seat, with a precious new life beside me. Instead, I rode home in the front seat, empty car seat in back. At my six-week postpartum check-up, I sat in my Dr.’s office, surrounded by all the familiar sights, sounds, smells of my pregnancy, of when she was alive inside of me. It was so difficult to be back in that office. Sitting across from Dr. M, he told us there is no medical explanation for why Lily died. Honestly, this is what I expected. I was just waiting to hear the words from him. I know there was nothing I did and nothing I could have done that would have saved her. In the future, if I have more babies, I will be considered high-risk. I will always wish I would have taken more photos and gathered more mementos. But I am thankful for what I do have and realize that no matter what I had, it would never be enough because it’s Lily that I truly want here. March 16th, 2010 was a day that has forever shaped my life. It was tragic and sad… but it was also more beautiful than those things. 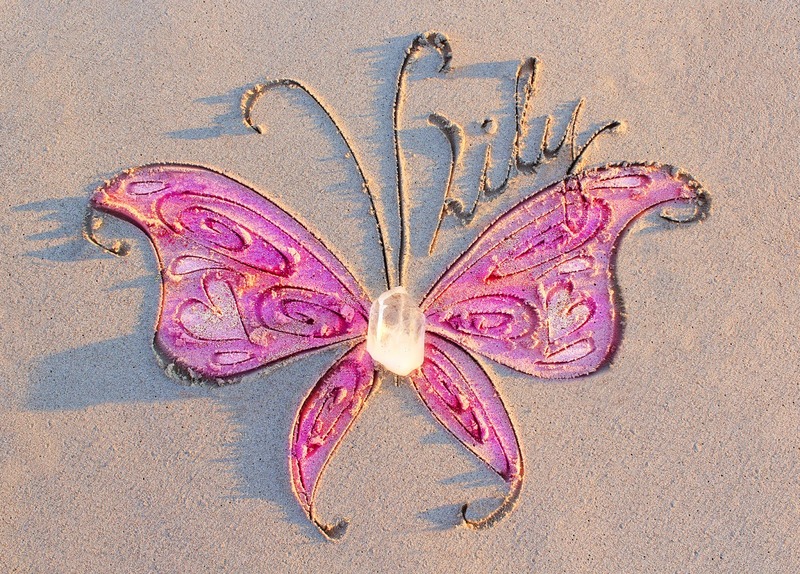 Yes, Lily died…. But before that she LIVED. And her birth was beautiful. Her life changed mine and I am forever thankful for the gift of her. I don’t want her death to overshadow her life. I don’t want to focus on the sorrow, but choose to look for the beauty among the ashes. I choose to look for ways to mother her legacy and make her proud. 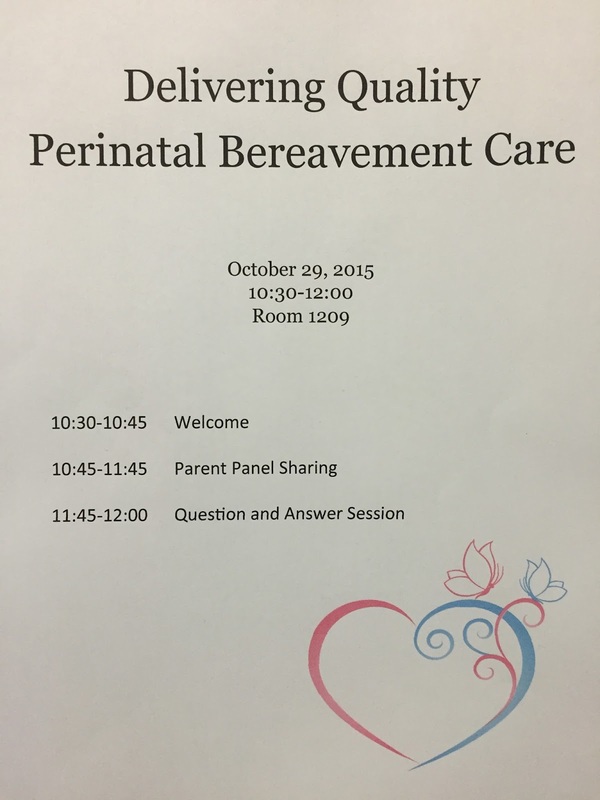 It has been such a joy to get involved more this year with the Perinatal Bereavement Committee here at Rex Hospital. The ladies are absolutely precious and genuinely care deeply about their patients, including those who are experiencing the loss of a baby. I want to thank them for allowing me to mother my Lily by sharing my experiences, by giving comfort boxes to be distributed to other families walking through a loss similar to what I walked through, and by asking me to be involved in different ways, such as coming today.